If you’re a runner, you know it can take a heavy toll on your body. 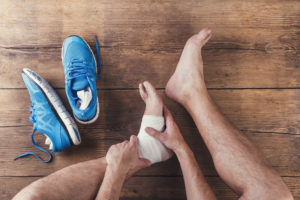 From runner’s knee to shin splints, an injury can sabotage your training or worse — it can take you out during the first leg of a competition for which you’ve spent months training. But you can help stack the odds in your favor. Whether you’re a beginner or a pro, here are six things you can do to help minimize your chances of getting hurt. Before you even hit the pavement or track, boost your confidence with the right running shoes. It’s best to get a proper fitting at a specialty running store. Your foot should fit snug in the heel, with a little wiggle room around your toes. To guarantee the best fit, wear your usual running socks when shopping for and deciding on shoes. It’s not enough to buy the right shoes. You also need to maintain them properly. We recommend replacing your shoes every 400 miles to 600 miles or about every six months if you run regularly. One of the best ways to prevent an injury is to keep your body loose and limber. To do this, add flexibility exercises into your routine. The more flexible your body is, the more range of motion you have and the less injury-prone you become. Yoga is a great way to improve your flexibility. It can enhance your balance and flexibility, and leave you feeling more calm and mentally focused. The stronger your muscles are, the less likely they will break down. Strength training can help you increase muscle tone, strength, endurance and bone density. Lift when your schedule can accommodate it. Ideally, you can work with weights at the gym or at home one day and run the next day. No one knows your body better than you do. If you’re feeling sluggish or run down, it’s best to skip training that day. Or you may need to reduce the time or distance you were originally planning to run. Rest is also critical. Take time off from running each week to help avoid injuries and fatigue that can occur when you push too hard. Always take it slow when you’re starting out. If you’re training for a 5K, you are not going to run five kilometers on your first day of training. Start with shorter runs and gradually increase your distance over the course of several weeks. Another tip — never increase distance and intensity during the same week. Finally, before you start your training, we recommend that you check in with your doctor. He or she may have some injury prevention suggestions and can address any possible limitations you might have. Implementing these tips can help make you a stronger runner and empower you to achieve your goals, no matter how ambitious they are.